Birds exposed to the persistent noise of natural gas compressors show symptoms remarkably similar to those in humans suffering from post-traumatic stress disorder, according to new research from Cal Poly and two partner schools. In some cases, the three species studied — western and mountain bluebirds and ash-throated flycatchers — also have chicks whose growth is stunted. The findings, published in the Proceedings of the National Academy of Sciences this week, add to a growing body of evidence suggesting noise pollution from human activity is harmful to wildlife. The University of Colorado Boulder and the Florida Museum of Natural History were also part of the study. When constantly exposed to human noise near oil and gas operations in New Mexico, the three species surprisingly had lower baseline levels of a key stress hormone called corticosterone. Researchers had expected those levels to be high. When the fight-or-flight response is constantly revved, the body sometimes adapts to save energy, which may have negative effects on the birds’ overall health and ability to successfully reproduce, he said. In the loudest areas, where machinery noise masks warning calls from other birds, researchers found that chicks had reduced feather growth and body size, likely a result of stress in mothers and nestlings. Though chicks developed similarly in the quietest areas, researchers hypothesize that adults in these areas are exposed to more predators and so have less time to forage because they are more cautious coming and going from their nests. The study also found that western bluebirds have lower hatching rates when nesting in noisy environments, even though they tend to gravitate toward such areas. “This is an example of an ecological trap: when an organism develops a preference for something that is actually bad for them,” said Francis. 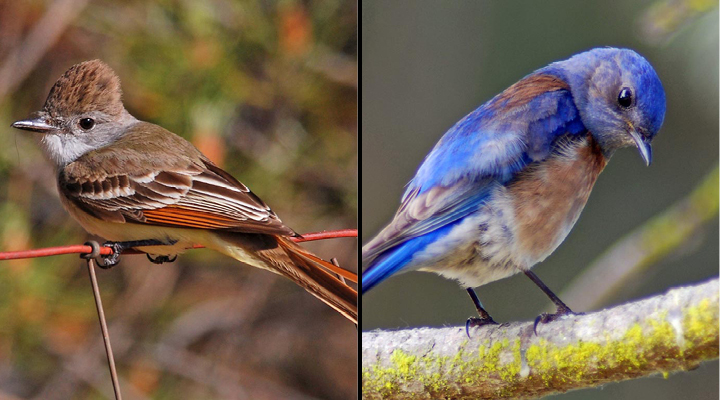 Western and mountain bluebirds and ash-throated flycatchers are not endangered, but researchers suspect that if other species react in similar ways, bird populations could decline as human noise increases, a conclusion that is supported by other studies. The study was funded by National Geographic, the National Science Foundation and the North American Bluebird Society.